THE STORY - Tami Oldham and Richard Sharp couldn't anticipate that they would be sailing directly into one of the most catastrophic hurricanes in recorded history. In the aftermath of the storm, Tami awakens to find Richard badly injured and their boat in ruins. With no hope of rescue, Tami must now find the strength and determination to save herself and the only man she has ever loved. THE BAD - Romance plot is bland and generic. Sam Claflin offers little from his performance. The screenplay’s structure gives too much attention to the least effective elements and underutilizes the parts that deserved more development. ​​​The ocean is a thing of equal parts beauty and terror. It is quite easy to be captivated by the awesome nature that surrounds you, as well terrified by the vast unknown that is incredibly isolating. It is no wonder why conflict on the high seas contains such a wealth of storytelling opportunities that have been explored by some of cinema’s greatest filmmakers, from Spielberg to Cameron to Hitchcock. It is a primal fear that we refuse to shake, for good reason. This film is yet another showcase of the dangers one is presented by the open water and the stakes one must face in order to survive. The film tells the harrowing true-life story of Tami Oldham (Shailene Woodley) and Richard Sharp (Sam Claflin). Tami and Richard are two young, free-spirited people who meet in Tahiti in 1983. There they start dating and fall into a passionate relationship. That’s when Richard is hired by some acquaintances to sail one of their luxury yachts across the Pacific Ocean to California. The couple views this as an opportunity to collect a large sum of money that will help them spend the rest of their lives together. However, danger lurks in the skies when a massive hurricane intercepts their path, leaving the boat a wreck and Richard badly hurt. It is up to Tami to plot the difficult course to Hawaii, battling rough seas and starvation, if they are to survive this ordeal. It must be said that the highest of praises that would be levied toward the film rests on Woodley’s performance. Much of the narrative is centered around her perspective, and even though she and Claflin share a considerable amount of screen time, it is Woodley who is doing most of the heavy lifting. She’s quite convincing in every scene, showcasing the tenderness and vulnerability of a lovesick soul as well as a determined survivor who must bear most of the strength to succeed. Whether emotion calls for something grandiose or subtle, Woodley delivers in such a powerful way, continuing her stance as one of the most capable young actors working today. Claflin is fine here, but his character is rather passive. Whether acting merely as the other half of the romance plot or laying on his back due to his injuries, there’s not much for him to do that makes a significant impact. Honestly, his own character’s admission of being “dead weight” felt quite accurate, thematically speaking. In truth, it is that central romance to the film that does prove one of its weaknesses. The relationship between Tami and Richard as dramatized has a sweet core to it but ultimately does not break the mold when it comes to similar relationships that have been played out on screen. It’s rather generic and bland and makes it all the more frustrating when comparing it to the rather enthralling sequences of survival out at sea. This problem is exacerbated by continually cutting back and forth between these two timelines, before and after the storm, which one could argue helps to dispense the monotony that could occur when watching what amounts to an extended exposition leading up to the main event. Had these events been condensed and more focus paid to the survival storyline much would have been improved. Still, when the film does choose to focus on the journey these characters must face in order to make it back to land alive, it is admittedly quite thrilling. Director Baltasar Kormákur captures the tension, isolation, and despair quite well, set up effectively by the film’s opening and perfected during the moment the hurricane hits and the ship’s fate is sealed. These are the moments where the film performs best, even as it contends with a shallow screenplay that never dips below the surface of its potential. Robert Richardson’s cinematography helps as well, and while it may not be as flashy as his collaborations with Tarantino or Scorsese, it still aids in heightening the emotions of the filmmaking, particularly out in the water. Praise must also be sung for an incredibly effective sound design that captures the surroundings so well, particularly during that intense hurricane storm. It should be noted that there is an element to the ending of the film that offers something of a reversal, and this review does not intend to reveal such an element. However, it must be said that this development in the story is one that only further emphasized a desire for certain elements of this narrative to have been condensed and given a greater spotlight to the parts that were the most effective. Apologies for the vagueness, but suffice it to say, the buried reveal does little to elevate the story and instead makes one wish for an even tighter focus that could have proved more compelling. 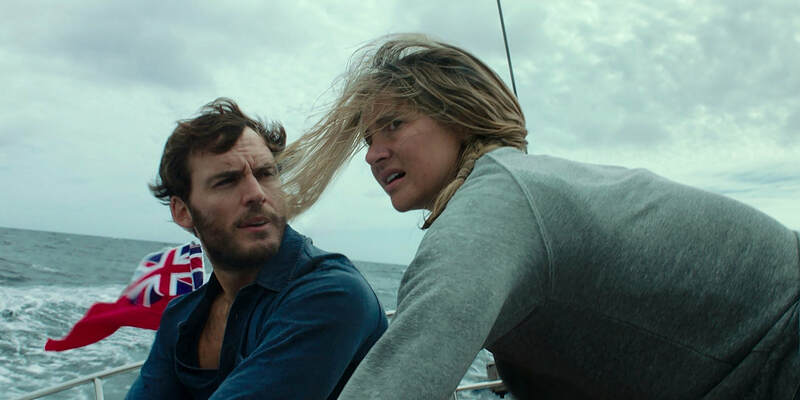 Overall, "Adrift" is a film that desperately attempts to overcome its generic and bland foundational story elements with some thrilling sequences of survival on the seas, and it often comes close to succeeding. The moments on the boat not only provide some thrilling scenes where the terror is authentically felt but also gives a showcase for Shailene Woodley’s solid performance. Unfortunately, the screenplay expands on points that are of little interest to the overall impact of the story while shortchanging the moments that could have benefited from expansion. This is nowhere near the level of other great survival stories, but there are enough effective occasions to see the potential this film could have achieved.